The music business has been in decline for the last seven years. CDs are not selling in the numbers they used to, which is a worry for the record industry as well as retailers. The online revolution took the record industry by surprise and it has been playing catch-up ever since. "I think the music industry has to accept its fair share of the blame for not acting quickly enough to digital music," said Adam Benzine from Music Week magazine. "There was a feeling in the music industry around 1998 when Napster first came out, well, there was simply a feeling of bewilderment and confusion. "What is this thing, how do we deal with it and, more importantly, how do we turn it off? How do we stop people putting music on the internet, rather than how can we monetise this and how can we embrace this?" The recording industry is finally hitting back and mobile phones are leading the charge. CD sales might be tumbling but digital music sales are steadily increasing. Unfortunately digital growth only accounts for a tenth of overall music sales, so they are still not making up for the shortfall generated by CDs. There is one territory which is bucking this trend though. 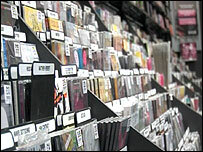 Digital music sales in Japan are sufficient to offset the loss made by CDs. In fact, Japan saw a 1% rise in music sales last year. Industry observers attribute this rise to mobile music downloads. "Fixed-line services are not as successful as over-the-air-delivered music services to mobile phones." 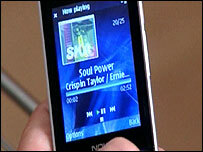 Downloading via mobile offers the user the ability to browse a store's back catalogue, purchase and download music all via a mobile phone while on the move, cutting out the need to download songs using a computer. Adam Benzine said: "Pretty much everybody in this country over the age of 12 has got a mobile phone with them, not everybody has got a music device with them, but everybody has got a mobile phone so you've got an immediate captive audience." Globally, various mobile music stores have launched; the UK has seen three launch in recent weeks. Generating more hype than the average Hollywood blockbuster, Apple's iPhone downloads songs using wi-fi from its already successful iTunes store. Muscling in on the download action, the world's largest mobile phone manufacturer Nokia has launched its own store. Both of these are download-to-own options, which means music is purchased and downloaded to a mobile - that music then belongs to the phone's user. Prices for individual tracks are much the same around 79p or 99 cents. However, iTunes will only work with an iPhone or iPod Touch and so far Nokia's store will work with a handful of its phones. Mobile music company Omnifone has teamed with networks in the UK, Sweden and Hong Kong to provide a subscription-based service. Called MusicStation it offers unlimited downloads for a subscription fee of £1.99 ($1) a week. But downloaded music will only be accessible as long as the subscription is maintained. Unlike the other two offerings here, MusicStation will work on a variety of handsets from different manufacturers. And unlike the iPhone it downloads via 2.5 or 3G connections, meaning it can download from any location. Possibly throwing a spanner in MusicStation's works, Nokia is also planning a subscription service which allows users to keep the music they have purchased after the subscription has expired. So far they only have a confirmed content deal with Universal Music but say they are in discussions with the other major record labels. Rob Lewis, CEO at Omnifone, said: "Clearly at the moment there are lots of different parties looking to secure a position in the music game. "Most of the manufacturer solutions, iPhone is an example, you buy the music to the device and you can only transfer it from one device to another if you stay with the same manufacturer." Users are also restricted with what they can do with their music by DRM, Digital Rights Management software. This software is an anti-piracy measure and restricts what the user does with downloaded music after purchase, limiting or complicating transferring music from a phone to any other device. "The biggest hurdle that mobile music companies currently face is that it's just not easy enough to buy music on the mobile phone," said Mr Benzine. "It's a long-winded and quite difficult process even for early adopters that it's stopping the wider mass market from embracing mobile music at the moment." The potential for mobile music stores to generate serious revenues is certainly there, but until issues such as DRM and subscription versus ownership models are resolved, mobile stores still have some work to do before the charts are filled with tunes downloaded using phones.